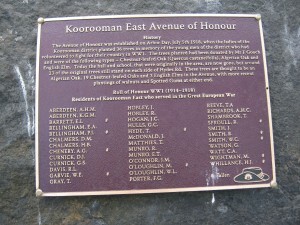 In 1918 the community of Koorooman East honoured the local men who enlisted for The Great War (World War One) by planting an avenue of honour. They also had an honour board made. Originally there was one tree per man. Ian Lester convened a public meeting to discuss restoring the avenue. David Shambrook, who has a relation with the same surname on the board, took on the work of researching the names and applying for a grant to have a plaque made. Steve Missen from the South Gippsland Shire organised the restoration of the trees. The plaque containing the names of the men was officially unveiled on Remembrance Day, Sunday November 11th. All members of the historical society and family and friends of the men on the honour attended the ceremony. # BELLINGHAM, P.J. O’CONNOR, J.M. # CHENERY, A.G. PORTER, F.G.
DAVIS, R.L. # SPROULL, R.
# GARVIE, W.E. SMITH, J. GRAY, T. # SMITH, R.
HOBLEY, J. # SMITH, W.C.
HULLS, G.C. # WIGHTMAN, M.
# HYDE, T # WHILLANCE, H.J.